Q. As a faculty or staff member, how do I log in to NoodleTools with the new Single-Sign-On? Refer to the directions below to log in to NoodleTools with the new single-sign-on. If you have additional questions or concerns, please use the "Contact Us" box on the right to chat, email or text a librarian. Students should refer to this FAQ. Click on email tab and select your Gmail account. Click on the "waffle menu" and click More. Click "Citation Generator" or the NoodleTools icon. See #6 "Linking to a previously created account" or #7 "Create a new account" below. Enter the ID and password associated with your existing account and click Submit​. 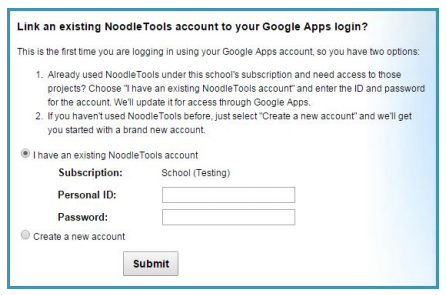 Your Google account will now be associated with that existing NoodleTools account, and you will see your projects. Click the "Create new account" option to generate a new, empty NoodleTools account. From now on, use your Heartland Gmail address to log in to NoodleTools!